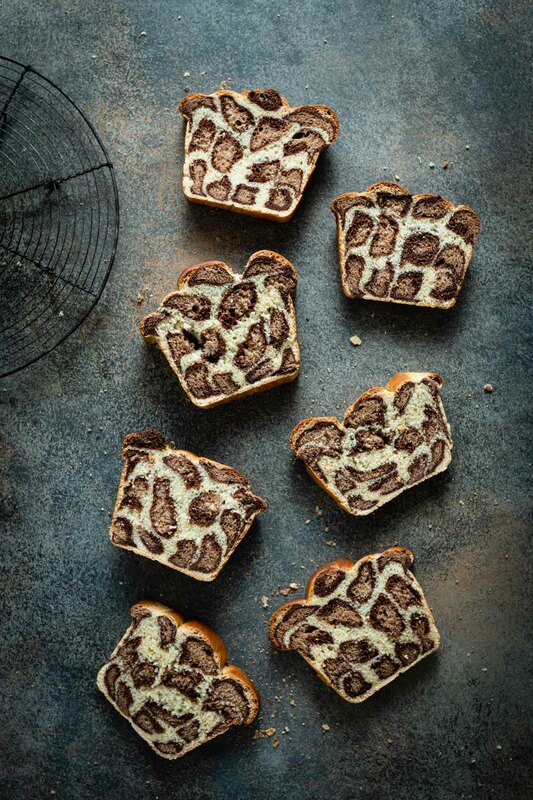 I’m sure you’re thinking, “Leopard Milk Bread what the?” But, honestly its so fun to make and tastes even better!! 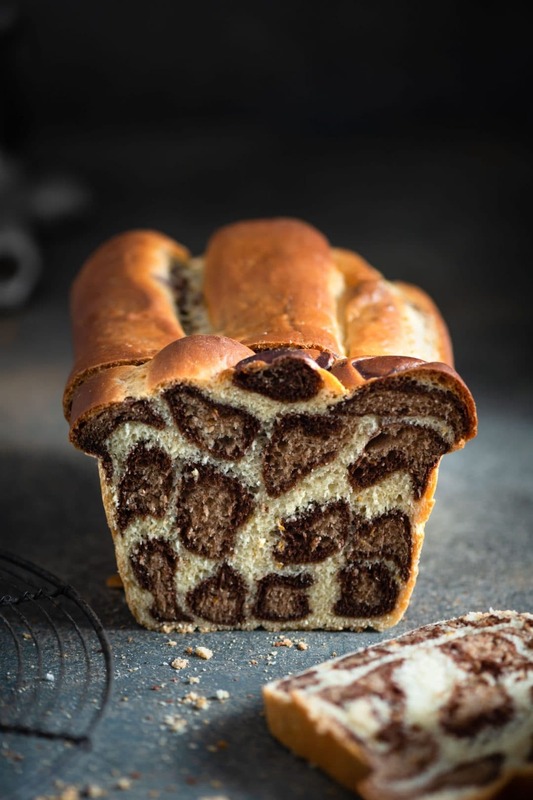 Soft orange and chocolate bread with a little bit of fashion thrown in the mix. The use of milk instead of water is what makes this enriched dough so wonderful. 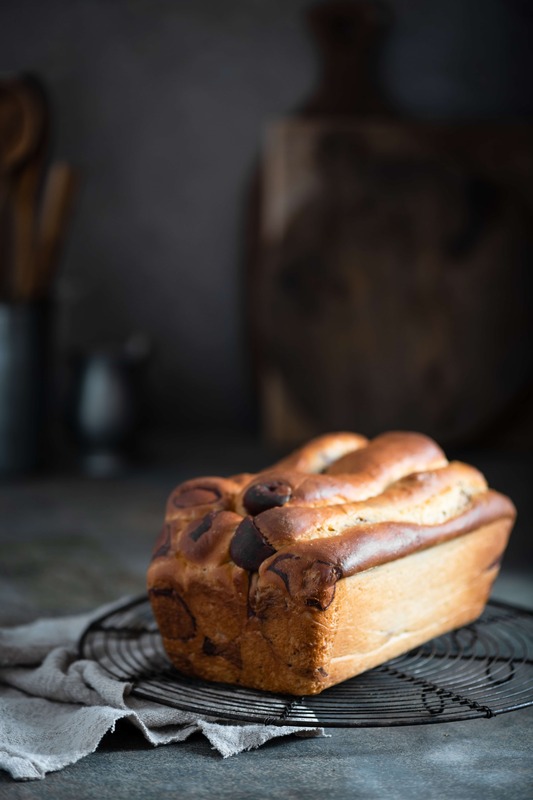 The delicate springy textured of milk bread gives it more of a dessert feel than an actual loaf bread. The best part about this recipe is the surprise when you cut the first slice. I love the excitement of seeing all the perfect layers of leopard spots. But, don’t let the spots freak you out, its basically rolling up three flavors of dough into hotdog shapes and stacking them into the loaf pan. The hardest thing, is wrapping one color of dough around the other. Use whole milk or almond milk, either is fine. Make sure to warm your milk to 110 F, too hot and it will kill the yeast. Add the orange zest, sugar, and butter before spooning in your flour. Use the dough hook attachment on your stand mixer. Slowly spoon in flour in medium speed, and then turn up to medium high until dough has formed. The dough should be very slightly tacky, with a soft and smooth texture. Once formed, let the dough rest for about 10 minutes. Then either hand knead or beat with dough hook at medium high speed for another 6-8 minutes. Tear off a small piece of dough and stretch out with your fingers. A simple “window pane” test will let you know if the dough is ready. If not, beat for another 2-3 minutes and test again. Weigh your dough and divide into two halves. Lightly dust one half with flour, wrap in plastic wrap and place in the fridge. Take the second half and evenly divide it into halves. Now make you light and dark chocolate pastes in two separate bowls. Add one section of dough to each. Work the chocolate into the dough with your hands. Kneading to incorporate all the chocolate into each dough. You should now have one dark chocolate ball of dough and one light chocolate ball of dough. Lightly flour each ball, cover in plastic wrap and set in the fridge. Let all three dough balls chill for about 60-90 minutes. Remove all three dough balls from the fridge. Weigh the white ball of dough and divide into 7 equal pieces. Repeat with the light and dark chocolate dough balls. You should now have 21 pieces of dough. Start by rolling each of the light brown pieces into a small hot dog shape. Then using a rolling pin roll each of the dark chocolate hunks into flat oval. Place the light chocolate sausage onto the flat dark chocolate oval. Using a pastry brush lightly coat the edges of the dark chocolate with milk. Then fold the dark chocolate over the light chocolate as if you were wrapping a hot dog bun around a hot dog. The result should look like a chocolate cigar. Now take the white dough and toll into a an oval with the rolling pin. Repeat the process by placing the dark chocolate wrapped ‘sausage’ onto the white dough oval. Paint the edges of the white dough with milk and then fold it over the dark chocolate, closing the seems. The result should now look like a log with a light chocolate center, a wrapping of sark chocolate, and then a final wrapping of white dough. Repeat this process with the remaining dough until you have 7 logs. Now, roll each log lengthwise with your hands, until it becomes doubled in length. Like a long snake. You should now have 14 skinny logs. Take an (11 x 21 cm) loaf pan and line with parchment paper that fold over the long sides for easy lifting of the finished loaf. Start stacking your dough logs into the pan. For this loaf I did layers of 4, with a top layer of 2 logs. Cover with a light tea towel and place in a draft free warm location to puff and double in size. At least an hour. Bake bread until inner temp reaches 190 F, it should be golden brown and sound hollow when tapped from the bottom. If you feel the loaf is browning too much, cover loosely with aluminum foil. Place pan on a cooling rack for 5-8 minutes. Lift loaf from pan by grabbing the overhanging parchment paper. Let bread cool another 10 minutes. I recommend chocolate hazelnut spread, peanut butter, or honey for a topping! 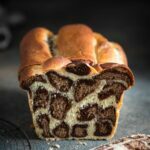 Leopard Milk Bread Recipe made with bread flour, cocoa powder, and orange zest. 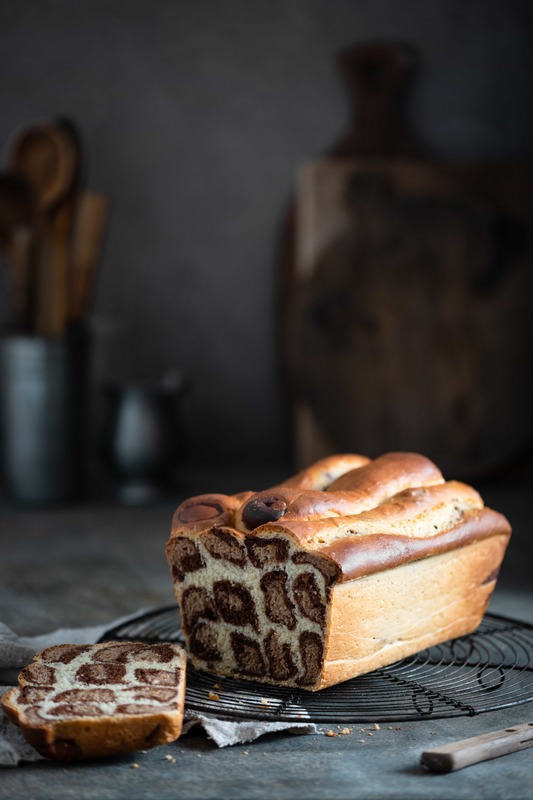 Soft homemade bread recipe with fun leopard spots! Stir cornstarch in cup of warm milk until dissolved. In the bowl of a stand mixer, combine milk mixture, yeast, and 2 Tbsp of the sugar. Gently stir together and let sit for 8-10 minutes until frothy. Add melted butter (cooled to room temp. ), the rest of the sugar, vanilla and orange zest to yeast mixture. Using the dough hook attachment mix on medium low speed. Slowly spoon in flour on medium speed, and then turn up to medium high until dough has formed. Turn mixer back on to medium high and beat for 6-8 minutes. Take the second half and evenly divide it into two halves. Use a separate bowl for each paste. Stir cocoa powder and milk together with a spoon. You should have one thick chocolate paste and one light chocolate paste. Place one of the remaining halves of dough in each bowl of paste. Now take the white dough and toll into an oval with the rolling pin. Repeat the process by placing the dark chocolate wrapped 'sausage' onto the white dough oval. The result should now look like a log with a light chocolate center, a wrapping of dark chocolate, and then a final wrapping of white dough. Stack dough logs into the pan. Then turn down to 350 F (176 C) and place loaf into the oven. Bake for 35-45 minutes or until inner temperature reaches 190 F.
Thanks so much for posting. It was so much easier than it looks. I used a sourdough bread recipe and it turned out great. I wish I could post a picture here to show you. Thats wonderful!! I would love to see it. Send a pic via email! Great recipe but mine came out more giraffe than leopard. Please explain the stacking stage. Great hit with guests! Thanks! I’ll try it again and keep you posted!